of the cardiovascular, immune and nervous system. UV light intensity and exposure time can be moderated. actually reduces the risk of breast, colon and prostate cancer. bronzed skin is, in fact, the best kind of protection from the sun. Our natural skin colour is determined by skin pigment—melanin—and the presence and amount of melanin in an individual is determined by hereditary factors. When our skin is exposed to UV light, specific cells known as melanocytes initiate a process whereby more melanin is produced. As it gradually rises through the epidermis, this melanin subsequently grows darker, thus producing a skin tan. 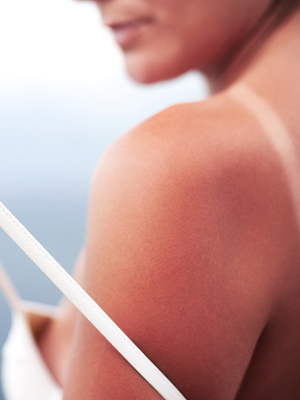 Exposure to UV light also causes the outermost layer of the skin to thicken. This is the body's natural way of building up protection to sunlight, which in turn helps to avoid burning, irritation and sensitivity. Nevertheless, different skin types react differently to UV rays: whereas darker-skinned people generate melanin readily and therefore tan easily and quickly, fair-skinned people (whose skin effectively contains many fewer melanocytes) produce much less melanin and are in some cases quite incapable of achieving a tan, either by sunlight or by sunbed. When the tanning process is accelerated or intensified, this results in sunburn. And if the skin's repair mechanism is triggered too frequently, it can become exhausted, resulting in permanent damage. Most people can use a sunbed, but there are some exceptions. You are aged under 18. If you have freckles or an excessive amount of moles. If you always burn in natural (sun) light. If you have a history of sunburn, particularly from childhood. If you have a medical condition that becomes irritated by the sun. If any member of your immediate family has had skin cancer. If you are taking regular or special medication, please check with your pharmacist or physician before using a sunbed, as certain drugs can make the skin more sensitive to UV light! If you are pregnant, Mystic® Spray Tan produces 100% safe, flawless and immediate results. There are six different skin types. Very fair skin, with lots of freckles. Red or sandy hair. Blue or grey eyes. High burn risk. Skin turns red and peels. Advised not to tan in sunlight. Do NOT use a sunbed. Fair, possibly with freckles. Blond to brown hair. Green or grey eyes. High burn risk. Great care should be taken in tanning. Bronzage tends to be light. Fair to light brown. No freckles. Dark blond or brown hair. Green or grey eyes. Medium risk of burning. Capable of building up a moderate tan. Medium-tone skin. Dark brown hair and eyes. Sunburns are rare. Tanning is rapid and deep. Dark brown skin. Dark hair. Brown or dark eyes. Sunburn is rare. Tanning is rapid and deep. This type of skin has natural protection. Never burns. This type of skin is fully-protected. At Sunlounge®, we always tan responsibly, gradually and in total safety! 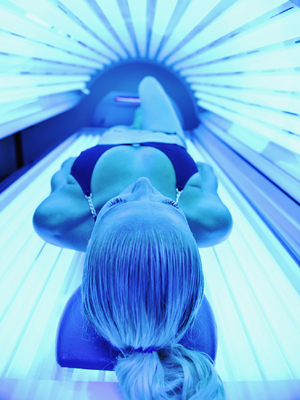 And we replace the solarium lamps in our machines regularly and usually well before their expiry date, so our clients can get a beautiful-looking tan quickly (typically in just 3 sessions, though more sessions may be required for skin types 3 or 4). Average session duration: 10-12 minutes. Use the Selector or the chart below to determine your skin type and the most suitable tanning method for you. Select... Fair, with freckles—You have red/blond hair and blue/grey eyes. Fair—You have blond hair and blue/green/grey eyes. Light—You have light brown hair and blue/green/hazel eyes. Light-Medium—You have brown hair and blue/green/brown eyes. Medium—You have dark brown hair and brown eyes. Dark—You have dark hair and dark eyes. 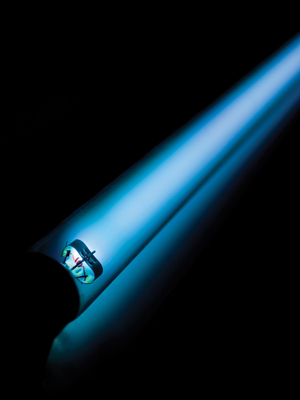 Sunbeds employ special lamps designed to simulate sunlight. These lamps emit UVA and UVB rays, but go a stage further and control the output balance of UV rays, minimizing the risk of burning and maximizing the benefits of tanning. Originally patented in the late 1800s to cure a range of skin diseases, sunbed lamp technology is still subject to ongoing research and development. High-pressure solariums (Sunlounge® VIP™ class sunbeds) are devised for immediate results. Special filters absorb much of the UVB, leaving only the UVA. This allows for deeper and faster tanning. Bronzage from this class of sunbed lasts much longer. Low-pressure solariums (Sunlounge® LUXURY™ class sunbeds) emit UVA and UVB just like the sun, inducing radiant colour with additional benefits for the body. This kind of exposure to UVB stimulates the production of vitamin D, essential for the absorption of calcium. Tanning for good health, natural glow and repair. Sunlounge® is certified by the Hellenic Indoor Tanning Federation. Tan responsibly! Use salons that replace their solarium lamps on a regular basis.